Mike's Half Bird got two thumbs up! Mike and I are always trying to find new restaurants, but one old faithful that never fails is the Basics. Their food has never disappointed, but what's even better is the amazing deal they have. Between appetizers, dessert, and of course wine for me, Mike and I can easily rack up a $100 bill on even a casual date. At the Basics however, a mere $60 will get you two appetizers, two entrees, two desserts, AND a bottle of wine! I really can't even fathom how they make any money given the price and the quality of food. If you haven't been to the Basics, they serve gourmet southern food with a seasonal, local theme. We started with my absolute favorite, fried green tomatoes. They serve theirs with balsamic onions and a tangy honey mustard and they are oh-so-good. Mike picked (well, I made him pick) an autumn bruschetta with butternut squash, sweet figs, caramelized onions and gorgonzola, that was phenomenal (stay tuned for my at home version!). For entrees, I went with a filet mignon, which if you don't go for the $60 deal, is a steal at $18. 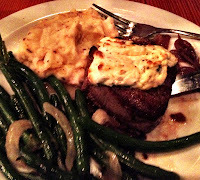 The filet was topped with goat cheese, cooked to perfection, and served with classic mashed potatoes and sautéed green beans. 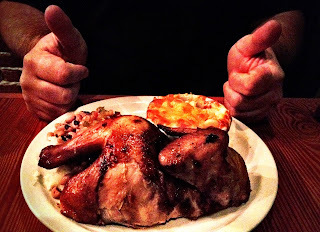 Mike went with the half-bird, which he gave two thumbs up, served with creamy mac n cheese. Mike was in heaven for dessert, mint cookies and cream cheesecake, and flour-less chocolate for me. All washed down with a great pinot noir, and i'd call it a success!